Thousands of runners are getting set for a traditional road race on Tyneside, now in its 27th year. The Blaydon Race is held on the 9 June, as in the famous anthem, which is sung before runners set off. It begins in Newcastle's Cloth Market, continues along Scotswood Road and over the River Tyne before ending at Blaydon Shopping Centre. About 4,000 fun, club and elite runners are set to take part and there will be traffic restrictions along the route. 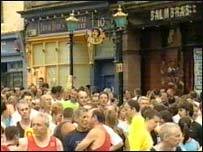 The race, organised by Blaydon Harriers and Athletics Club, begins at 1800 BST, and the starting bell will be rung by the Lord Mayor of Newcastle, assisted by two teenage Harriers. The song was composed by George Ridley in 1862 about a charabanc journey to the race meeting.